I absolutely adore this wedding! Not only can you tell everyone was having a wonderful time throughout the day, the attention to detail that went into creating the perfect place for everyone to have fun is impeccible! From the bridesmaid’s dresses, to the crayons and coloring sheets for the kids, this is one of those perfectly put together wedding and reception. This gorgeous event took place at the McKinney Cotton Mill in McKinney, TX. They have a beautiful outdoor ceremony area at the mill, see below! Then you can easily just step out back for photography galore! Aren’t the colors absolutely perfect here! Way to go Alyssa!!! Then on the other side of the mill is an enclosed room perfect for receptions, see below! 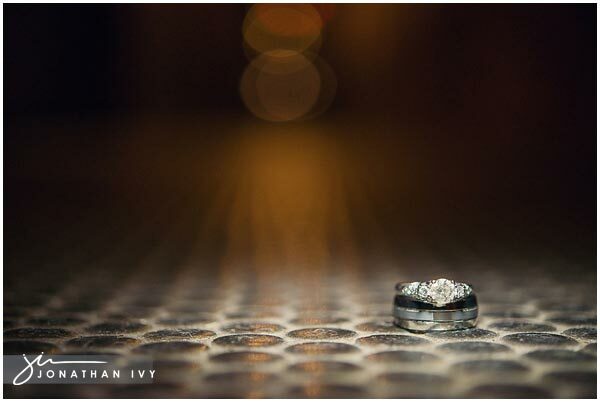 I mean even their floor is so cool we used it for our ring shot! Isn’t this the perfect rustic, chic wedding! They did a great job! Please click here to see their Wedding Slideshow!